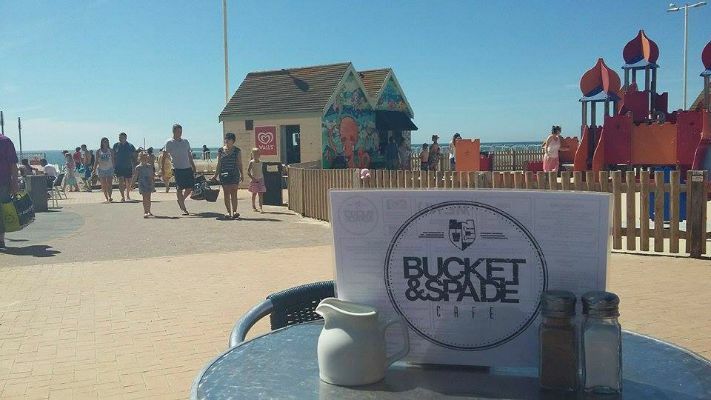 Situated right on the promenade with a sun catching patio and overlooking the sea is a wonderful little family run cafe, Bucket and Spade, that is as tasty as it is homey. 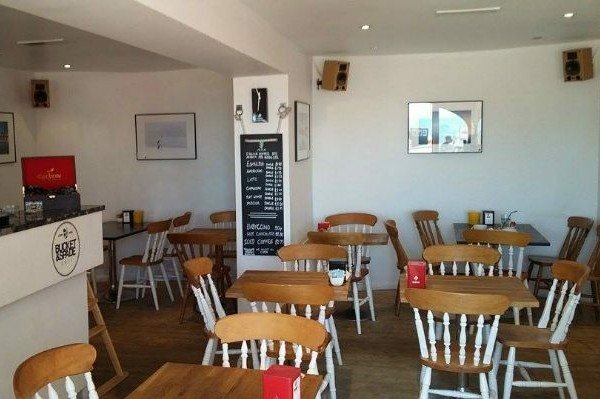 Famous for being family friendly, this colourful little cafe has all the charm and hospitality that you would expect from a true locals spot. The first thing I noticed about Bucket and Spade was how open and friendly all of the staff was. Each person greeted us with a big hello and a smile, even the chef, and I immediately felt right at home. To me great service can make a good restaurant great, and I was already giving full marks before having a seat, well done. Our sweet and bubbly waitress Kirsten handed us some menus to peruse while she cheerfully cleared a table for us in the sunshine. 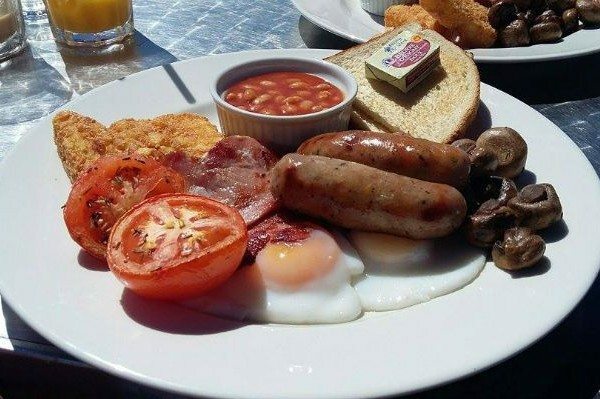 these guys know how to do a proper Full English. 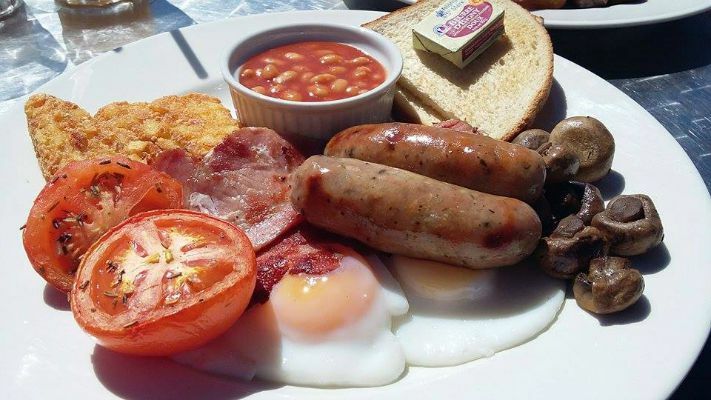 The menu is modest for hot breakfast specialising in traditional fry ups and breakfast baguettes; which is absolutely ideal for those of us needing a, post Friday night, fried egg experience. 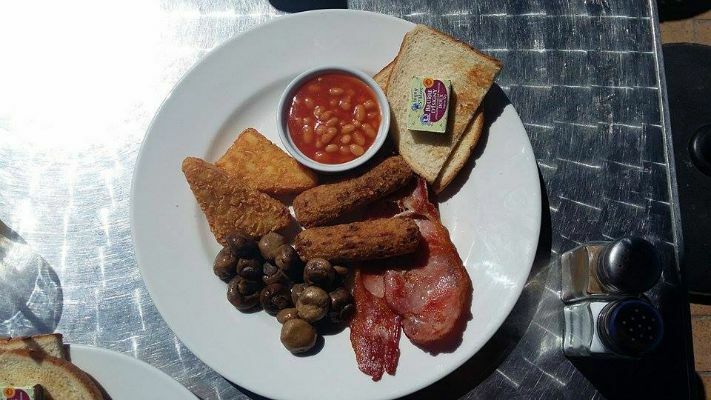 As it so happens it was my friends birthday the night before and we may have opened one too many bottles of prosecco, so to make everything right with the world, I just had to have the Bucket and Spade Full English. When I say full I mean Full, served with two slices of smoked bacon, two juicy cumberland sausages, two runny fried eggs, a garlic and rosemary roasted tomato, crunchy hash brown, a side of baked beans, butter fried mushrooms, and soft buttered toast; it was exactly what the doctor ordered. Obviously the plate was piled high, but I was set for the challenge, and wow it was good. My friend opted for the Veggie version (with a side of bacon, Ha!) and there were several minutes where we didn’t make eye contact…the understood silence that falls when your food has arrived. The portion size was brilliant, the eggs were runny, and there is something so ultimately satisfying about creating the perfect bite; egg, toast, mushroom, and bacon, dipped in beans, yes! I sipped down my life saving breakfast with a refreshing Moak iced latte, and sat satiated in the sun reminiscing of California, what a perfect way to start the day. Dont worry if you aren’t in the mood for stacks of fried deliciousness. For those of you that crave a lighter bite for breakfast, Bucket and Spade also offer more healthy alternatives; such as muesli, granola and yoghurt, and freshly baked pastries. They also have a whole list of lovely hot and cold drinks such as Sri Lankan Charbrew teas, speciality Moak coffees, juices and smoothies…not to mention Twix Milkshakes, yum! 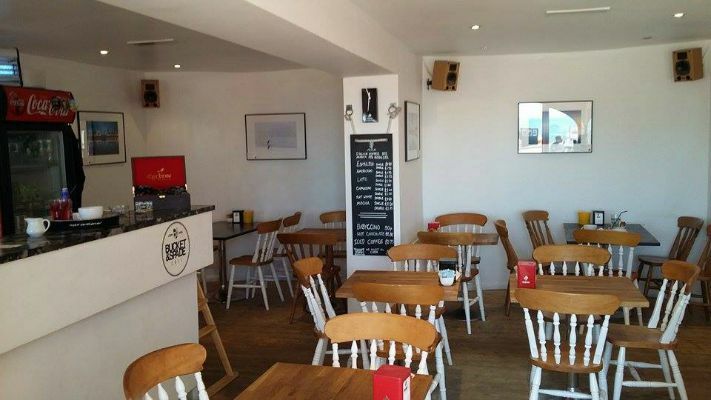 The cafe is clearly a favourite with families, and why not, it is in the perfect location next to the play area. They offer a kid’s menu that is ideal for pint sized diners. I saw more than one family filling up the kids with a hearty breaky before letting them loose in the playground to burn it all off. The next time I come I will most definitely be bringing my niece so she can have her own little mini Kid’s Breakfast and a paddle in the pool. 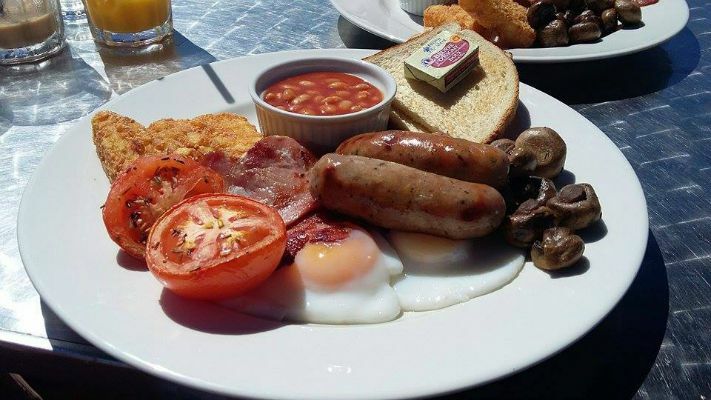 Not only is their breakfast delicious, but after a solid morning of rushing around, splashing and swimming, Bucket and Spade is the perfect pit stop for lunch and maybe even a cheeky ice cream. Their lunch menu is made to order and filled with beautiful fresh salads, piled high sandwiches, and juicy burgers. After noon they also serve adult beverages, so parents can enjoy a cider in the sun while the kids get treated to homemade doughnuts and ice-cream. 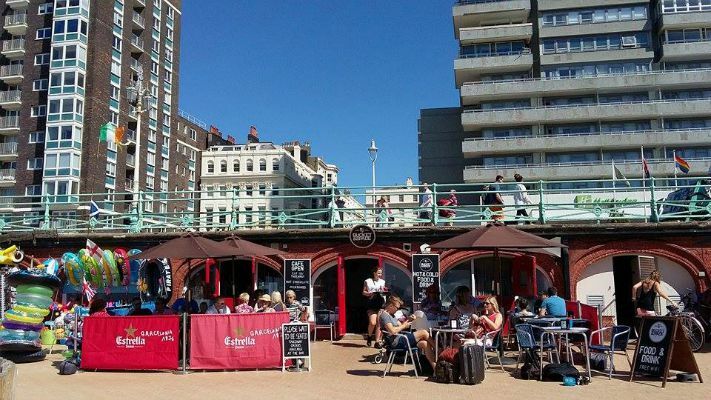 When I think of the perfect little Sunday I’m pretty sure it doesn’t get much better than sitting by the sea in the bright sunshine, enjoying a fresh fruit smoothy and diving into a full English breakfast; and what better spot than Bucket and Spade, this cafe truly is a Brighton gem.